The big asteroid, which flew by Earth last month, belongs to new category of space stones. On May 31 asteroid 1998 QE2 and its moon flew by in 3600000 miles (5800000 km) from Earth thanks to what it became the most approximate with our planet during in the next two centuries. 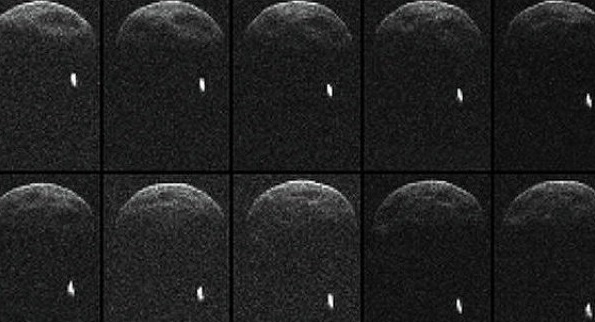 The new radar images made by Arecibo radio telescope in Puerto Rico revealed that it is a unique binary asteroid. 1998 QE2 asteroid is dark, red, and primitive that is it doesn’t heat up or melts so as far as other asteroids. 1998 QE2 asteroid isn’t similar to one asteroid, which the scientists observed. This is absolutely new animal in a menagerie of the asteroids approaching with Earth. 305 meters Arecibo radio telescope and 70 m the antenna of a network of long-distance space communication of NASA traced 1998 QE2 asteroid as it came nearer to Earth last month. Arecibo radio telescope continued supervision of a near-earth asteroid when it went to space depths. As a result, images of radar helped researchers to measure 1998 QE2. Diameter of the dark, main asteroid covered with craters makes 3 km, and it has 750 m the moon, which rotates round it once at 32 hours. The sizes of the moon of QE2 make about a quarter of the main asteroid. In the same way and our Moon is equal to about a quarter of the size of our planet. Studying of the moon and its orbit has to help scientists to determine the mass of the main asteroid that in turn will allow to shed light on object structure.